As conservationists race to slow the rate of deforestation taking place in the Philippines, scientists are pursuing equally time-sensitive goals: documenting the country’s native fauna. Scientists have documented nearly 100 native lizard species so far; but, as illustrated by the description of three large lizard species since 2001, conservationists fear that many species may disappear before scientists discover them. The IUCN Redlist already classifies five Philippines lizards as endangered and one as critically endangered. 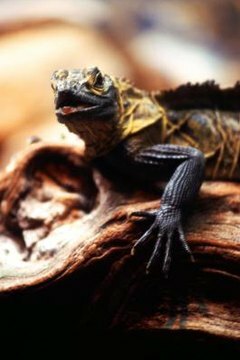 The Philippines is home to 14 lizard species that herpetologists classify in the family Agamidae. Nine species of flying lizard (Draco sp.) inhabit the trees, where they consume insects, spiders and smaller lizards. While not capable of powered flight, flying lizards use their enlarged, lateral skin flaps to glide from tree to tree. Male flying lizards also use these flaps in elaborate territorial displays. Philippine sailfin dragons (Hydrosaurus pustulatus) spend much of their time basking on branches near the water; if the lizards see a predator, they will quickly dive into the water where their excellent swimming abilities allow them to escape. Skinks exhibit great diversity in the Philippines; 56 species call the islands home. In general, species diversity increases as the density of the vegetation increases. A 1988 study by Auffenberg and Auffenberg, examined the habitat and diet partitioning of 11 of the country’s native skinks. Mangrove skinks (Emoia atrocostata), live exclusively near the coast in mangroves, swamps and rock outcrops. By contrast, the beautiful Philippine spotted-green tree skinks (Lamprolepis smaragdina philippinica) are common in a variety of habitats, but particularly secondary growth forests with abundant basking opportunities. The critically endangered Cebu Island worm skink (Brachymeles cebuensis) is a small species that inhabits the leaf litter and deposits its eggs under rocks and logs. The spiny waterside skink (Tropidophorus grayi) lives in small crevices near forest streams, and is unusual among skinks in having serrated scales. Most of the country's native skinks hunt for invertebrates and smaller lizards. At least five monitor lizard species inhabit the Philippines. They include three species that are members of the “water monitor complex,” and two arboreal species that live similar lifestyles. A few decades ago, scientists considered V. marmoratus and V. nuchalis to be regional varieties or subspecies of the wide-ranging water monitor (Varanus salvator). However, a 2010 study by Andre Koch, et al, published in “Zootaxa,” demonstrated that these forms are distinct species. Meanwhile, scientists have known that the fruit-eating Gray’s monitor (V. olivaceus) lives in the Philippines since Edward Hallowell described it in 1859, but it took 142 years for scientists to discover a very similar, fruit-eating species that also inhabits the nation's trees. The Panay monitor (V. mabitang), like all of the country’s other monitor lizards, is a large lizard that attains 5 feet or more in length. Geckos are common in the Philippines, and the various islands hold 49 species in total; of these species, approximately 85 percent are endemic to the country. Four species of false geckos (Pseudogekko sp.) are thin and delicately built species that inhabit trees and shrubs. The intermediate flying gecko (Pytchozoon intermedius) uses numerous skin flaps attached to their body to help camouflage from predators and to glide from tree to tree. The largest native species, the tokay gecko (Gekko gecko) commonly reaches 12 inches, but can in rare cases grow to 16 inches. Though the majority of the native geckos consume insects, worms and spiders, large tokay geckos also eat lizards, frogs and small rodents.